“Branch & Bough” is a project that has been in the works for many years. It’s beginnings lie in a seed that was planted many years ago, across the oceans of time and space, in the land that birthed the first mother. When her firstborn daughter came of age, her mother asked her to remember. “Remember what?” her daughter asked. “Remember this.” Still not comprehending, though understanding the depth of what she was being asked to do, those words resided within her spirit, and so, almost without knowing why she did it, she passed this message on to her own daughter: “Remember.” And so it was passed down through generations, across continents, oceans, rivers, through mountains, written on clouds, intertwined in tree branches, and encoded in dreams when those memories had been forgotten. I will present “Branch & Bough” in RhinoFest at the end of the month. “Branch & Bough” is a generational story which explores the ideas of progeny and legacy. This one-woman show is an inquiry into discovering that which is gained and/or lost through generations of women and passed down from mother to daughter through genetic memory, bloodlines, and dreamscapes. Through this project, I will have the opportunity to heed the words of my grandmothers, to show my appreciation for their sacrifices, to honor and respect those who came before and helped to pave the way. For many years, my creativity was focused on visual art (painting, drawing and printmaking) and writing (which I rarely shared with others). By developing my writing through the Interdisciplinary Arts MA Program at Columbia, and by being introduced to my performative voice through Drama, I have been able to paint a picture of the grandmothers who I got to spend only the briefest time with before they left this earth. Through collecting stories about these women, and filling in the ellipsis to imagine the radius/diameter/circumference of their experiences, I have been able to illustrate their lives for the purpose of getting to know them. It is with the greatest respect that I endeavor to bring their stories to the stage to present them to you. 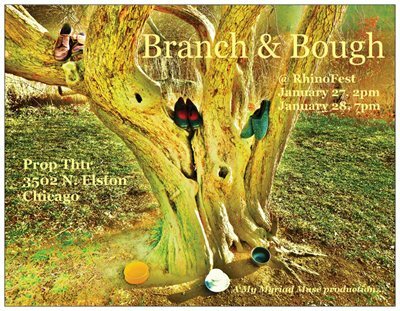 “Branch & Bough” will be presented at Prop Thtr on January 27, 2pm; and January 28, 7pm. Get tickets here. This entry was posted in Uncategorized and tagged Ancestors, Branch & Bough, Performance, Prop Thtr, RhinoFest 2013, Theater. Bookmark the permalink.